When it begins operating in 2022, the $500 million Large Synoptic Survey Telescope (LSST) will capture some of the sharpest night sky images ever produced, giving scientists an unprecedented view of near-Earth asteroids, supernovae, and the Milky Way galaxy. 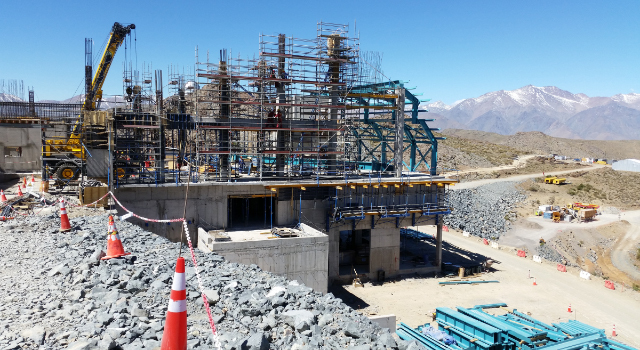 But the telescope, under construction atop a peak is Chile’s northern Andes, also presents an unprecedented challenge for astrophysicists—it will require a complicated scheduling algorithm to determine where to point the telescope as it traces the sky. To Harvard student Daniel Rothchild, that sounded like a puzzle he could solve. Working with Christopher Stubbs, Samuel C. Moncher Professor of Physics and Astronomy, who is a contributor to the LSST project, Rothchild launched an independent research project to develop a scheduling algorithm that would be effective in this unique situation. The LSST, which will image the entire night sky every three days, will stop at each point for 30 seconds before moving onto a new field. Longer calculation time leads to a much more complicated algorithm and that could easily bog down the telescope’s progress. The algorithm must also overcome the challenge of determining the “best” place for the telescope to look, when there are literally 10 billion possibilities. Rather than using machine-learning or mathematical merit functions to determine the ideal next field, Rothchild is writing code that will give the telescope a baseline optimal path to follow, along with instructions for how to respond when faced with adverse weather and unexpected downtime. Programming a set path for the entire 10-year span of the project allows scientists to explicitly optimize global properties of the telescope’s data, instead of hoping the merit functions or machine-learning algorithms will perform those optimizations themselves, he said. It also eliminates the headaches of trying to determine why the computer pointed the telescope at a certain location, or troubleshooting a machine-learning algorithm that seems to be aiming the telescope far off the best course. His code lays out a path for the telescope to follow using a combination of astronomical data and meteorological predictions. Rothchild’s method involves much faster calculations than other scheduler algorithms because there are no machine-learning elements. Several other researchers are working on schedulers, and all have taken a slightly different approach. Once the telescope hardware is complete, the LSST leadership team will test each scheduler and select the one to use. Though he still has six years to wait before the LSST has its eye on the sky, Rothchild is excited for the opportunity to contribute to such a significant astrophysics project. Through research and scholarship, the Harvard School of Engineering and Applied Sciences (SEAS) will create collaborative bridges across Harvard and educate the next generation of global leaders. By harnessing the power of engineering and applied sciences we will address the greatest challenges facing our society. Specifically, that means that SEAS will provide to all Harvard College students an introduction to and familiarity with engineering and technology as this is essential knowledge in the 21st century. Moreover, our concentrators will be immersed in the liberal arts environment and be able to understand the societal context for their problem solving, capable of working seamlessly withothers, including those in the arts, the sciences, and the professional schools. They will focus on the fundamental engineering and applied science disciplines for the 21st century; as we will not teach legacy 20th century engineering disciplines. Instead, our curriculum will be rigorous but inviting to students, and be infused with active learning, interdisciplinary research, entrepreneurship and engineering design experiences. For our concentrators and graduate students, we will educate “T-shaped” individuals – with depth in one discipline but capable of working seamlessly with others, including arts, humanities, natural science and social science. To address current and future societal challenges, knowledge from fundamental science, art, and the humanities must all be linked through the application of engineering principles with the professions of law, medicine, public policy, design and business practice. In other words, solving important issues requires a multidisciplinary approach. With the combined strengths of SEAS, the Faculty of Arts and Sciences, and the professional schools, Harvard is ideally positioned to both broadly educate the next generation of leaders who understand the complexities of technology and society and to use its intellectual resources and innovative thinking to meet the challenges of the 21st century. Ultimately, we will provide to our graduates a rigorous quantitative liberal arts education that is an excellent launching point for any career and profession.